Inequality has been often defined as a struggle between the capitalists and the working class. This description is greatly attributed to Marx’s views on capitalism, “a society composed of two groups that have opposing interests and whose relationship is exploitative.” However, due to the steady fall of worker share on GDP, inequality is “quickly becoming a problem between the financial industry and the rest of the world, and the bad news is that finance is wining” (S. Keen). The graph above shows what happens to a relative stable capitalist system when the workers share of GDP begins to fall below certain levels. 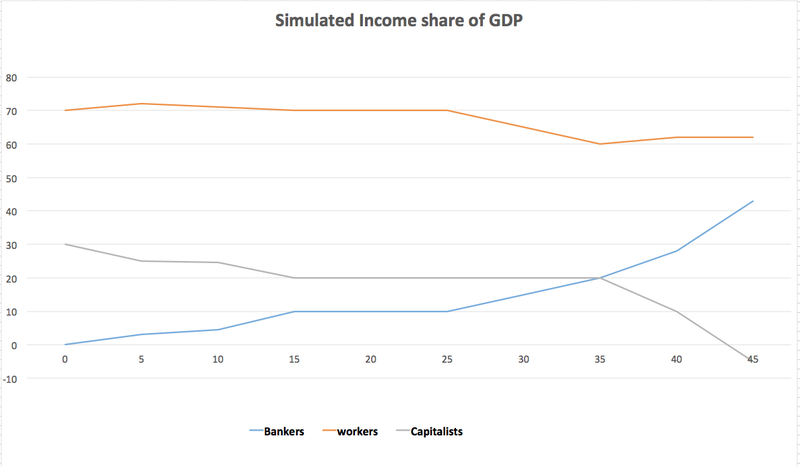 Once the workers share reaches their lowest point, the ratio of GDP share for the financial industry begins to raise exponentially, while the income for both capital owners and workers begins to fall exponentially at an equivalent rate. This evidence suggest that while lowering costs is in fact beneficial for the current system, there is limit at which point further lowering worker’s wages leads to an immediate transfer of wealth from owners of production means to the financial institutions. This would certainly not be a problem if financial institutions contributed to the economy in a similar way that manufacturing does. Unfortunately, that is not the case, and money earned by the banks remains unspent if is not borrowed again.The rich should be very worried about the current levels of inequality, because if the working class is unable to recover from this crisis, they are immediately next in line, if they are not already suffering the consequences of market deflation. Moderate inequality is part of a healthy system that fuels innovation and class mobility. However, when the engine of this system (worker’s consumption), begins to slow down or stalls due excessive exploitation, the problem of extreme inequality begins to affect both, upper and lower classes, imposing a faster pace of reduction in wealth on the upper class due to high overhead and large expenses associated with their lifestyle. In this self-created debt trap, the debt to income ratio of consumers was already maxed up in 2008, making it highly susceptible to small market variations, creating a wave of increased systemic risk. Small market failures created a chain reaction that nearly brought down the global economy to its knees. This situation created an indirect problem for federal banks whose regulating mechanisms during times of crisis require lowering interest rates to fuel more borrowing. However, because consumers were still maxed out in debt from the crisis, this technique did not yield the expected results. This is the primary reason why the markets have failed to recover or show signs of growth since the last economic crisis. A large portion of people’s income is still going to repayment of debt. Governments were swift to act, but they bailed out the wrong industry. Inequality due to debt has become so extreme that it has placed both producers and workers in a similar disadvantaged position without discrimination. If I were a wealthy capitalist, I would think that lobbying for policies that will strengthen the structure of workers income may be a good investment. Workers income is the central piece through which modern economic and social institutions are built, including government, and the free market. If we let the engine of capitalism die, the very fabric of society will dissolve. The politeness of waking up in the morning to make a living may succumb to a dystopian vision of the future where the term ‘survival of the fittest’ may become a lot more literal. At this point, protecting workers rights is no longer a choice for wealthy capitalists but a wise contribution to their own survival. I agree with this article but am also concerned how this problem of wealth inequality encompasses so many other aspects that go against the average American as well. The wealthy in my opinion would also be very wise to demand that they once again be taxed at the rate of the pre-Eisenhower years. And that their stock and bonds be taxed higher as well. They would still be very wealthy and this would be of great benefit to our family, America. We should also review history to remember why the Glass-Steagall Act was first implemented and after said review it should become quite obvious what we are facing if we do not re-implement the Act because history always repeats in principle.